Andi Alcott is a self-made success by the age of 28. Between owning a bar and running her own private investigation business, she manages to keep busy… which is really all she wants out of life. She is especially excited to take on a new case as a distraction from the upcoming five year anniversary of her brother’s death; she becomes even more thrilled when it seems her new case points to an old foe, an international thief known only as Jax. Issuing a challenge to her ex-childhood sweetheart, Detective Dante Ruiz of the Sheridan County Police Department, the race is on to see who can catch Jax first. But when Andi finally comes face to face with the elusive criminal, she learns that not everyone nor everything is as it seems. Add in a museum robbery with a strange and unbelievable motive that includes murder, and Andi’s desire to keep busy begins to make her unravel. 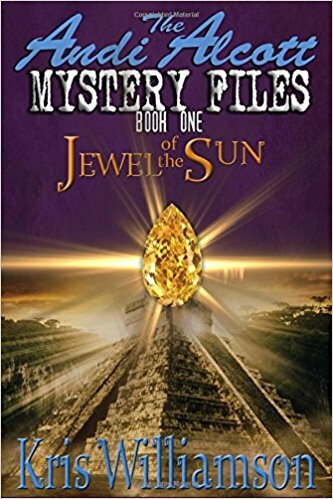 At the heart of her problems is a missing gem known as The Jewel of the Sun, which comes with a strange and deadly legend. Can she, Dante, and Jax figure out who stole the Jewel of the Sun before anyone is killed? Find out in this first adventure in the Andi Alcott Mystery Files series!